Excerpt from the description: for people with a wider set of views; less formal atmosphere; "more freedom to discuss many related issues of interest (theology, doctrine, humour, politics); anonymity allowed; credentials not required or desired. The first list, started by Wieland, filled the gap after the old TC-list. My guess is that the second list started because some people wanted to discuss Textus Receptus Only, KJV-only, or "wider issues" (e.g. doctrinal, etc). Perhaps some also felt surpressed because of lack of academic credentials (as judging from the list description). The third list, I suspect, also has to do with the moderation on the first list, but there is now an avoidance of KVJ-Only/TR-Onlyism and strict focus on academic discussion (which is good). This is my highly subjective interpretation (full of guesses) of a development that is rather sad. Now we have three lists (and some seem to contribute to more than one). Time will tell if we have reached the peak. I don't suppose it is worth calling it a quiz anymore, but there are certainly things here to discuss. "I bring you good news of great joy!" Well, it is not as good as THAT news of course (Luke 2.10-11); but I thought you might like to know just the same. Images are available on-line here. Two of these we are already discussing in previous posts. And what about this one? There is not so much to it so I'll give you front and back (or is it back and front?). "Virtual Manuscript Room" – Call for Collaborative Thinking! We have mentioned the "Virtual Manuscript Room" (VMR) previously on this blog, in our report from SBL (IGNTP presentation). Now Ulrich Schmid has asked me to post the call below, related to the VMR on our blog. In addition to responses sent directly to Ulrich and Martin (e-mailaddresses below), I also take the opportunity to encourage comments and discussion of the VMR on this blog. Virtual Manuscript Room – call for collaborative thinking! manuscripts with related information and electronic transcriptions. the relevant data pertaining to the items included. 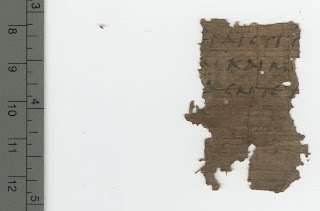 of Matthew and are not written on papyrus? New Orleans Baptist Theological Seminary (NOBTS) is having the 2008 Greer-Heard Forum on the topic of the Textual Reliability of the New Testament this coming April 4th-5th, with some extra meetings taking place on April 3rd as well. The main speakers are Bart Ehrman and Dan Wallace, with responses by David Parker, Mike Holmes, Dale Martin, and Bill Warren. The event will be on the campus of NOBTS and is jointly sponsored by the Center for New Testament Textual Studies. As you might surmise, Bart Ehrman's works on "Misquoting Jesus" and "The Orthodox Corruption of Scripture" will figure heavily in the discussions. The Evangelical Philosophical Society will be hosting a special event in connection with this forum with several well-known evangelical scholars present in conjunction with that event. Also, Martin Heide is the speaker on Thursday at two events hosted by the Center for New Testament Textual Studies and the Biblical Studies Division. His presentations relate to the NT text and canon. For more information or to register, go to the Greer-Heard website (www.greer-heard.com). Housing is available at a modest cost on the seminary campus. You can also see reports on SBL on the Amsterdam NT Blog. This is a reminder that the call for papers to the SBL International Meeting to be held in Auckland 6-11 July 2008 is still open (until 1 February). Since I chair the Working with Biblical Manuscript (Textual Criticism) section at the International Meeting, I would particularly like to invite papers to this section (note that you need to log in with your SBL membership number in order to submit a proposal). "A final touch of unpleasantness"
Obviously we're all gearing up for the end-of-year ETC Oscars. I nominate Hugh Evelyn-White for "Most endearing text-critico-autobiographical footnote". He's describing the room in which he transcribed the St Macarius Monastery texts. I particularly like the end. "If another should ever have the opportunity of exploring this 'waste-paper room', he should be forewarned that it is entirely lightless and airless and that every movement raises choking clouds of fine dust which cannot be dispersed. Furthermore, the ancient timbers overhead swarm with voracious vermin which are roused to activity by the light or warmth of candles, and the proximity of a latrine adds a final touch of unpleasantness." (H.E.-W., Intro. 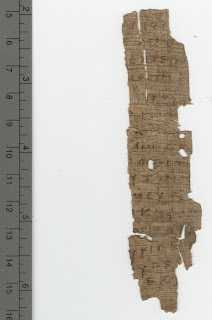 to New Coptic Texts from the Monastery of St Macarius, xlii n. 3). On Monday afternoon at SBL we had a wonderful miscellany of papers. Others who who there may like to make some comments about this session, which followed the ETC Blog lunch. Unfortunately (you might think 'typically'), I had to rush from presenting to the Mark group in the morning, back to my hotel to run through my afternoon presentation, before rushing back for this session. I must also say that as I was the fourth presenter and was waiting patiently/nervously for my own time I wasn't able to pay as close attention to the first three presentations as I would have liked. Also most people used some form of projected material, but the presenters were lined up at the front where we couldn't see the screen. First off was our very own Tommy Wasserman (Örebro Theological Seminary) on 'Two Verses Plucked From the Fire: Jude 22-23' which was a closely argued treatment of the major problem here. And a very good job he did too. Second was Matti Myllykoski (University of Helsinki) on 'POxy 4009: Case Closed': this was marred by the fact that he couldn't get his laptop to project anything and had no real back up plan (except for a handout); so we had repeated references to what we could not see on the screen. Seemed to want to argue, using a different reconstruction from Luhrmann, that the back of this definitely was a part of the Gospel of Peter (but I could be wrong, as I was trying to think of what I could do if I couldn't get my laptop to project). Third was Gerald Donker (PhD student at Macquarie University-Sydney, Australia) on 'The Pauline Epistles in Athanasius: A Contribution to the Alexandrian Text Type': this was a preliminary report on his research on this subject with a lot of complicated statistical stuff which I couldn't understand. Seemed to think that Athanasius in Paul used an Alexandrian text (but only had 44 samples so far). Decent presentation, although too detailed on the statistical front for me (although not for everyone judging by the questions from the floor). 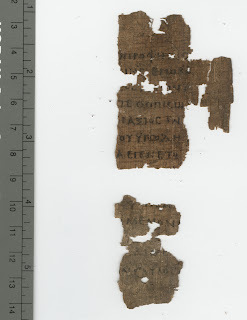 Fourth was Peter M. Head (that is me) on 'Notes on P. Oxy 4497 (P113): The Smallest Portion of the New Testament Ever Identified'. Fortunately the laptop and the projector shook hands and behaved, so I was able to get on with the job at hand. Basically showed how this tiny fragment could be identified with confidence, drew some lessons from that which might be useful in disputed cases of identification and then speculated on what it may have been from (a large double columned Pauline corpus collection). Fifth was Geert van Oyen (University of Utrecht) and Jan Krans (Vrije Universiteit-Amsterdam) on 'Geert van Oyen, University of Utrecht and Jan Krans, Vrije Universiteit-AmsterdamCodex Boreelianus Revisited: A Fresh Look at Codex F (09) after 160 years '. I really enjoyed this presentation. Perhaps it was relief that mine was over; but they did a great (and occasionally hilarious) team job of their presentation. They had some of the most beautiful and detailed pictures I have ever seen projected. They conveyed a great deal of information in a very clear and entertaining way. Yesterday evening I arrived here in Kristiansand in Norway. I am here as a guestlecturer as part of the Erasmus “Lifelong learning program” for exchange of teachers, staff and students and I will be teaching for two days at Ansgarskolen. I think the article is balanced and well written (some minor details need revision, e.g. the date for P72, on p. 113 “ca 200” which should rather be ca. 300). Now, it would of course be interesting for me (and the readers) if the author could comment very briefly on how he regards this subject in general and his article in particular in retrospect after almost 15 years. Is there something he would modify, etc? Over at the Center for the Study of New Testament Manuscript, images of 12 manuscripts have been added, one of which is an unregistered manuscript in Yale. Read more at the manuscript section at CSNTM here. In San Diego I met director of the CSNTM, Dan Wallace and a lot of other friends. Below is a picture of us having coffee in the exhibition hall. From the left Rick Bennett (from Accordance), Peter Head, Jan Krans, Tommy Wasserman, Dan Wallace and Bruce Prior. Volume XVII (2004) of the Filologia Neotestamentaria journal was recently made available on-line here. Christian-B. Amphoux, «La grande lacune du Codex de Bèze.» , Vol.17(2004) 3-26. Abstract: "One of the most important NT manuscripts, the codex Bezae, included between the Gospels and the Book of Acts several writings that are nowadays lost. The present article corrects the author’s former views, published in 1996, concerning the contents of this lacuna: the 66 missing pages may very well have included a seven letters corpus, in fact a forerunner of the Catholic Epistles corpus, including Hb but not yet Jd. 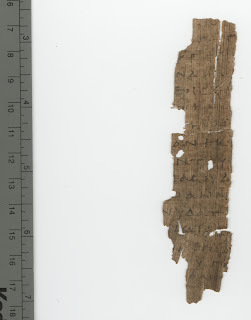 The analysis of these letters allows us both to understand better the period of redaction of NT writings and to bring this enterprise in connection with the writing process of the Old Testament." Matthew D. McDill, « A Textual and Structural Analysis of Mark 16:9-20.» , Vol.17(2004) 27-44. Abstract: "The purpose of this study is to address two questions: 1) Should Mark 16:9-20 be included in biblical exegesis and 2) If so, what are the structural features of this passage that might aid in its interpretation? In order to answer the first question, the external and internal evidence concerning this passage as a textual variant and the question of its canonicity will be explored. The second question will be answered by presenting a diagram of the passage’s syntactical and semantic structure and by making observations concerning the unit’s overall structure and development." Josep Rius-Camps and Jenny Read-Heimerdinger, «The Variant Readings of the Western Text of the Acts of the Apostels (XVI) (Acts 9:31–11:18).» , Vol.17(2004) 45-88. Abstract: "The present section deals with the events concerning the conversion of Peter (Acts 9:31–11:18) whereby he at last comes to understand that the good news of Jesus is for Jews and Gentiles alike. 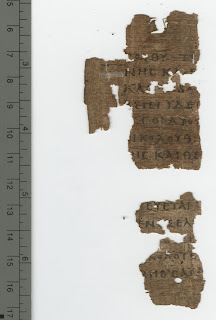 Since the Greek pages of Codex Bezae are missing from 8:29 to 10:14 and the Latin ones from 8:20b to 10:4, we have noted in the Critical Apparatus the variants of other witnesses that differ from the Alexandrian text. From 10:4b (fol. 455a), the Latin text of Codex Bezae is available. 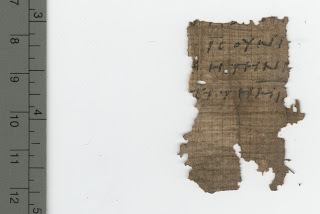 The Greek text starts at 10:14b (fol. 455b)." Christopher M. Hays, «A Fresh Look at Boso&r: Textual Criticism in 2 Peter 2:15.» , Vol.17(2004) 105-110. Abstract: "Commentators have often been stymied by the idiosyncratic patronymic Bosor assigned to Balaam of Beor by the best textual witnesses of 2 Peter 2:15. However, detailed investigation of the development of the Balaam traditions in tandem with the Edomite king-lists of Gen 36:32, 1 Chr 1:43, and Job 42:17d (LXX only) reveals a tightly intertwined history that paved the way for the unintentional replacement of Bewr with Bosor. The confusion of numerous other names and places associated with the two titles in the Septuagint and Targums witnesses to a trajectory which culminated in the textual variants of 2 Peter 2.15." The next volume, Volume XVIII (2005) will be available in the next couple of days. The third edition of the Apostolic Fathers by fellow blogger Michael Holmes was on display at both ETS and SBL at the Baker Academic bookstall. It is a beautiful piece of bookmaking, so nice that the many on this blog who already own an earlier edition will want to get a copy of this one. I noticed that a very large consignment was brought in at the beginning of SBL and on Baker's table. It rapidly dwindled and the whole consignment seemed to be gone before the end of the conference. The book is a small, green hardback, and approximately the same size as the small NA27. The paper has good opacity yet is so thin that the 800 pages are only slightly thicker than the NA27's 800 pages. The paper is also whiter than the creamy NA27. Most pleasant of all for reading is the font and generous leading (whitespace between lines). One's impression while reading is that this is delightfully 'clean' and 'clear'. They chose the GentiumAlt font with its lunate (should we say 'selenic'?) perispomenos tonos. A stiched, gold-ribbon place marker allows one to restrain the English side of the book and to comfortably read with one hand. The Apostolic Fathers, Greek Texts and English Translations, 3rd edition, edited and translated by Machael W. Holmes, after the earlier work of J. B. Lightfoot and J. R. Harmer. Baker Academic, 2007. ISBN 978-0-8010-3468-8. For those interested, 'the dove' περιστερά, is now included in Martyrdom of Polycarp 16.1, and the textual apparatus in general has been "significantly expanded". At the same time, references in the text to the apparatus have been simplified so as not to distract from smooth reading. Incidently, Michael dedicated the edition to his father William Holmes and to Bruce Metzger (doktorvater), both of whom passed away in 2007. Michael is deservedly happy with the outcome of this edition and we on the blog will want to extend a sincere 'Congratulations'. I know that he worked hard with the publisher in producing this. 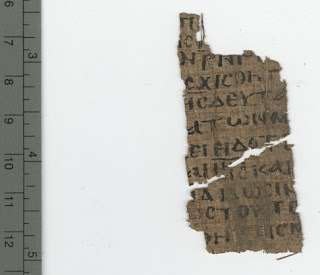 Another interesting item in Novum Testamentum is Paul Foster's paper 'The Disputed Early Fragments of the So-Called Gospel of Peter - Once Again' NovT 49 (2007) 402-406. We noted Paul Foster's original article here; where I made the prophetic comment: "I suspect the Luhrmann's of this world will want to respond to Foster at some point." Well Luhrmann did respond (NovT 48 (2006) 379-383) and now Foster is responding in his turn to what he sees as a personal attack. Such things are, unfortunately, extremely interesting and well worth reading. Keith Elliott has published a second supplement to his A Bibliography of Greek New Testament Manuscripts in the most recent issue of Novum Testamentum 49 (2007) 370-401. While this will be of general interest, it also marks (I think) a significant moment in the history of this blog, since on p. 386 it includes a post on this blog among the bibliographical items cited. I am open to correction, but this is the first time I've noticed the ETC blog appearing in an academic journal. Hopefully it won't be the last time. So well done Tommy, and thanks to Keith for noticing us. Another item worth noting is the number of ETC bloggers who appear in this supplement: Tommy Wasserman (whose name appears a phenomenal 11 times - don't get a big head Tommy, lots of them are still "forthcoming" and we know what that means don't we! ); Peter M. Head (once sadly without the "M"); Dirk Jongkind (although the book doesn't appear); Michael Holmes; Peter Rodgers and Amy Anderson. So well done all ETC bloggers for productive work on Greek NT manuscripts. Dan has now published the answers he was aiming for in his quiz a couple of days ago (here), and it seems that we have done rather poorly (see the brief discussion here). I scored nil out of seven attempted questions, which, I think, looks impressive in comparison to my senior colleague’s nil out of ten. Over at the Parchment and Pen Blog, Dan Wallace provides a TC quiz. 2. How many of the original New Testament books still exist? 3. How many manuscript copies of the Greek New Testament are known to exist today? In the Mail: The Greek New Testament with Dictionary (WH); "Leather Bound"? Today I finally received my long-awaited copy of Westcott and Hort The Greek New Testament with Dictionary in the new Hendrickson edition. However, I was a bit surprised and disappointed to find that the book was in ordinary hardcover, I had expected smooth leather. When I placed my order the book was said to be "Leather bound" (at Amazon). Now I see that several resellers indicate "imitiation leather" or just "hardcover". Read more about the publication at Hendrickson's website here. David Parker: "Textual Criticism and Theology"
For various reasons, the topics of textual criticism and theology are disconnected. The importance of reuniting them is explored with reference to: the concept of the original text, theologically motivated textual variation, concepts of orthodoxy, and the texts as historical documents. This article offers a fresh theological approach. Parker draws attention to: (1) The erroneous assumption that the only goal of textual criticism is the reconstruction of the original text; (2) The debate as to whether textual variations were theologically motivated; (3) The assumption that the New Testament was produced and preserved by orthodox circles; and (4) Doctrines of Scripture ordinarily ignore the reality of the origin, nature, and historical development of the Bible. (1) The concept of the restoration of an original text is both inappropriate and impossible (no surprises here). Parker regards the wealth of textual variations as indicating that Christians treated them as living texts that could be expanded, re-worded, or reduced in order to bring out the true meaning of the text. The division between inspired Word, church reception, and church tradition are no longer discernible. The best we can do is to aspire to reconstruct the earliest collected edition of the text from the period 200-300 AD. The goal of the textual critical craft is the reconstruction of the development of the text and the relationship between different texts. He states that: "If the quest for an original form is set aside, the old recoverable form has still great significance. But there is no obvious reason theologically why that particular form of the text should be given a greater authority than a later one" (p. 586). Parker's point has been rehearsed enough and various criticism have been set forth. What I would contest is whether the journey towards an original text is quite so futile and I suspect that I am not alone in that optimism. In addition, an original text is significant historically for reconstructing first century Christianity and it is significant theologically if we are to ask what it actually was that God-breathed out. (2) Parker argues for the theological motivation behind many textual variants. The upshot is that: "we do not have a text received by the church, but one produced within the church" (p. 587). No objections from me on that one, but a few qualifications are in order. I dare to ask, what is the actual percentage of variations that can be solidly demonstrated as being theologically motivated? What criteria does one use to determine a theologically motivated variation? For example is the exomen of Rom. 5.1 based on a mishearing of the omicron/omega, or does it stem from a soteriological issue of whether peace with God is a reality or a possibility? Do you see the problem? (3) Parker objects to a view of the linear development of orthodoxy which created and preserved the texts. Citing Walter Bauer he maintains that "orthodoxy was only able to emerge once certain groups had the political power to outlaw groups with other points of view" (p. 587). Thus orthdoxy is a late phenomenon and it did not originate the texts themselves. Later he states that the text resulted from "the pluralism of early Christianity" (p. 588). I grow exceedingly weary of the Bauer-trump card that is so often laid on the table. Bauer's thesis has several discernible weaknesses including his view of the extent of the authority and influence of the Roman church, the development of Christianity in Egypt, and even his arguments about Christianity in Edessa have been challenged (see works by Robinson, Hultgren, Hurtado to name a few). The surviving point of Bauer's thesis is that Christianity in the early centuries was diverse and that point is so prosaic and banal as to no longer need restatement. That means that the group of big nasty orthodoxy bishops who eliminated the innocent pluralism of early Christianity is a myth. In many cases it was the NT text(s) that proved to be the undoing of the sectarian groups which is why Marcion took a knife to Luke's Gospel, why alternative Gospels had to be written, and it explains the introduction of some variants due to "heretics" who inserted alternative readings (though that is not to say that the proto-orthodox did not respond in kind). To be fair to Parker he is willing to admit that Ehrman's view is not the only show playing in town in regards to the significance of heresy and orthdoxy for textual criticism. And Parker is correct that we cannot assume that the text was transmitted exclusively through orthodox groups, but it is a fairly safe default setting to make in the absence of evidence to the contrary. (4) Parker argues that theological statements about the text are often made without reference to the nature of the text, how it was received, and the realities of textual criticism. Then he proceeds to argue that what we have in the textual critical enterprise are witnesses to a text and not access to the original witnesses themselves. Here I am very sympathetic to Parker. I opine the fact that few books on the doctrine of Scripture take serious account of textual criticism. There are some doctrines of Scripture that would fall apart if they ever came into contact with the Septuagint. If one is really fixated on the original autographs and assumes that the first Christians were too, then one was to explain why the early church sought to use a translation of the Old Testament that often did some very creative things with the Hebrew text. My point is not that the autographs are insiginificant, but there are a whole host of issues about canon and reception that need to be brought into the mix. I haven't read it yet, but I hope to read Craig Albert's book: High View of Scripture? The Authority of the Bible and the Formation of the New Testament Canon to see if this offers something that takes greater account of textual criticism. As for his view of witnesses (textually and theologically) all I can say is that not everyone agrees. If I am reading Parker correctly, he is saying that NT studies can only be textual critical studies or studies in reception-history. He writes: "all study of the NT text has to begin with the manuscripts, and having begun with them, cannot progress beyond them" (p. 589). On this account there is no possibility of a commentary on "Paul's letter to the Romans" only "The Epistle of Romans in Vaticanus" etc. Yet I think it worth pointing out that others such as Ehrman and Koester who have emphasized the diversity and corruption of the NT texts still find themselves adequately resourced to write about the historical Jesus, Paul, and the early church of the first century. It seems to me that our textual witnesses (albeit via a convoluted path) take us beyond a text and back to historical events and persons. Further to our previous note about the CSNTM Patmos expedition, Dan Wallace reports in another place about some new discoveries made this summer (they have located some "lost" manuscripts, but they are not saying which ones yet). The University of Toronto is hosting a conference (convened by John Kloppenborg) on "Editing the Bible" on 1-3 November 2007. Papers cover both Testaments and look exceedingly interesting. Two ETC bloggers will be giving papers. For more details. John Kloppenborg (University of Toronto): "Introduction: Editing the Bible"
Hindy Najman (University of Toronto): "Authority and Tradition: Archetypes of Tradition"
Eugene Ulrich (University of Notre Dame): "Insights from the Dead Sea Scrolls for Future Editions of the Hebrew Bible"
Sarianna Metso (University of Toronto): "Editing Leviticus"
Robert Kraft (University of Pennsylvania): "In Search of Jewish Greek Scriptures: Exposing the Obvious?" Kristen de Troyer (Claremont Graduate University): "From Reconstructing the Old Greek Biblical text to Reconstructing the History of the Hebrew Biblical Text: The Contribution of the Schoyen Joshua and Leviticus Papyri"
David Trobisch (Bangor Theological Seminary): "The First Edition of the New Testament"
Michael Holmes (Bethel College/International Greek New Testament Project): "What Text is being Edited?" Ryan Wettlaufer (University of Toronto): "Unseen Variants: Conjectural Emendation and the New Testament"
Holger Strutwolf (Institut für neutestamentliche Textforschung, Münster): "Scribal Practices and the Transmission of Biblical Texts – New Insights"
Peter Head (University of Cambridge): "The Significance of New Testament Papyri for a Critical Edition of the New Testament"
Klaus Wachtel (Institut für neutestamentliche Textforschung, Münster): "The Coherence Based Genealogical Method: A New way to Reconstruct the Text of the Greek New Testament"
Westcott and Hort unicode with original spelling? A blog request: I would like help in getting a reliable unicode version of Westcott and Hort. There is a caveat below, please note. The fonts are clear and the text looks quite inviting. (Wouldn't Greek subheadings befit a Greek document? Do others find English distracting within Greek?). Those WH spellings have a good claim to originality and it would be a shame for a new generation of students to think that WH themselves ignored the manuscripts on this, or that WH were not broadly confirmed by the 20th papyri finds. My request is, would someone send me or point me to a truer WH unicode text? The Perseus people have posted one, though their delineation and versification need to be corrected by hand when using with students. Does anyone have a clean unicode WH? We use the WH texts with our students in the summer SXOLH. Because of student use, I prefer an accented, word separated, correctly versified text. The other day I was introducing the Greek alphabet to some beginning students, and we checked in with the interesting alphabetical reflection in Rev 1.8; 21.6; 22.13. If you look at Rev 22.13 in NA27 you will see that it is printed with the alpha written out in full and the omega written as a single letter: EGW TO ALFA KAI TO W (the others are the same). I thought it might be interesting to see what some of the manuscripts had. So these two manuscripts reflect the same lettering as NA27: EGW TO ALFA KAI TO W. But the notable thing here is that both of these clearly indicate that the single letter W (omega) is an abbreviation (by using the over-line). This suggests that these manuscripts use the single letter to represent the word omega. If these two are representative (even if they are not, they are the earliest manuscripts), then the printed editions should therefore print the full word represented by the abbreviation: EGW TO ALFA KAI TO WMEGA. This is surely how this text was intended, understood and read in the seven churches to which this was written. Abbreviations are not normally reproduced in the critical edition. So do you agree with me that this would be worth revising in future printed editions of the Greek New Testament? For all those reading Arabic and deeply interested in the Arabic Version, there is now available by Brill (pretty pricy ...) a collection of articles, The Bible in Arab Christianity, ed. by David Thomas. Ever wanted to know about the Arabic version of John 1:1 & 1:18?, then read "The Arabic Versions of the Gospels: A Case Study of John 1:1 and 1:18". Or try "Anti-Jewish Polemic and early Islam", or "Is there Room for Corruption in the 'Books' of God?". Although textual criticism and textual history are not the main subjects, there is a lot of stuff available to get a glimpse of this rather neglected field of research. The PBS announced today that Rami Ayyad was found dead near the Bible Society Bookshop in Gaza early this morning. Rami was kidnapped last night by an unknown group directly after he closed the doors of the bookshop at around 16:30. A day before, Rami noted that a car with no plate numbers had been following him. News of his kidnap was reported to the main office after his family received a telephone call from him at around 18:00 saying that he had been taken by a group of people and will return home late that evening. Another phone call was made carrying a similar message. The director of the Bible Society had informed the Police in Gaza of the incident. At 6:25 this morning, news was received that Rami’s body had been found at a location near the Teachers’ Bookshop in Gaza were he had spent most of his time running the bookshop. Signs of bullets and knife stabs could be clearly seen on his body. Rami 26, leaves behind two young children, and a pregnant wife. The funeral is expected to take place at 16:00 today. No group or party has claimed responsibility. The Bible Society in Gaza has received previous threats and vandalism. However, the support from the community has been very well noticed because of the humanitarian role that the Bible Society has been taking the last four years in the strip. Dan Wallace has notified me about the very fruitful expedition that his team of four people from the Center for the Study of New Testament Manuscript (CSNTM) undertook to Patmos in the summer of 2007. "Monday was the first day that we were able to begin our digital preservation efforts. It took two trips to get all of the equipment and people up to the monastery in the ‘Patmos SUV’—a one-liter, four-door (!) sedan. We were grateful that we did not have to haul the camera equipment up the hill every day, but could leave it behind in the library for the duration of our work there. The car had to be left at the parking lot of Chora, as we hiked four hundred yards up the hill, lugging the equipment. The Abbot greeted us warmly as we began our work. We were so grateful for his support! The Monastery of St. John the Theologian includes two different libraries. Both libraries are immaculate. One is used primarily for study. 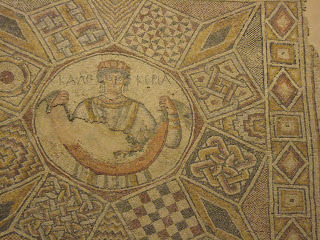 It includes many modern and resource materials in general circulation, used by the priests. The other library is dedicated to the collection of ancient books. Visually, it is breathtaking. It contains three or four reading tables in the middle of the room, surrounded by a cloud of silent witnesses, the bookshelves filled with the ancient volumes. One end of this library is roped off for a special collection of ancient manuscripts. This small library is one of the most important in the world for ancient Greek manuscripts. It also is a model of how these documents should be stored and cared for. What a wonderful environment for housing their collection of 80 New Testament manuscripts! It is clear that the monks of Patmos take their responsibility of these important artifacts very seriously. The assistant librarian, Ioannis Melianos, was waiting to assist us when we arrived. He truly exemplified a servant’s heart. Ioannis, always with a smile on his face, let everyone into the library. We were brought to a special room, used for photographing the documents. Every morning began with the team in prayer as an important part of the process. About the time that the computers were set up Ioannis would come in, announcing that coffee was served. Nothing quite like fresh-brewed Greek coffee to wake you up in the morning! The team usually began work by 9:30 and continued shooting until about 1:00 PM. The process used is designed to be efficient but never at the cost of damaging a manuscript. Each team member has an important responsibility such as squaring up the text, noting details about the leaves, taking the shot, turning the page, verifying the images on the computer. This year CSNTM was able to photograph thirteen manuscripts on Patmos that range from the 9th to the 14th centuries. Before photographing the manuscripts we prepare them by counting the leaves, confirming the content (Gospels, Paul, etc…), determining if the dating found in other sources is accurate, noting the material the manuscript is made of, and measuring the manuscript. This results in a detailed description of each manuscript, almost a unique fingerprint if you will. Included in those being preserved were Gregory-Aland 1175 and Gregory-Aland 1164. Manuscript 1164 had to be removed from a museum case in order to be photographed. It had probably been a very long time since this manuscript was last handled. The first paragraph or two of 1164 in each Gospel is written in gold ink. What a magnificent treasure this is!" Read the whole report here with nice images. For example, there is a very nice picture of Billy Todd preparing a manuscript for photographing (we know he isn't reading it since he holds the MS up-side-down). We are very grateful for the service that is being done to us in making these MSS accessible for research and we wish the CNSTM good luck in the future! How do you teach textual criticism to your students? In the program that I teach in, students get a single lecture on "text and canon" in first semester, a whole lecture on the text and transmission of the New Testament in a second semester Greek class, and thereafter they cover text critical issues spasmodically in subsequent exegesis classes. a. Clearing the deck. (i) Bible did not fall from the sky bound in leather, written in ye-old-Englishe, with words of Jesus in red, with Scofield footnotes, and with an introduction by J.I. Packer or Alister McGrath; and (ii) the Bible was not transmitted along the lines of a game of Chinese Whispers where "send reinforcements we're going to advance" becomes "send three and six pence, we are going to a dance". b. Introduce the different witnesses. I talk about papyri, codices, lectionaries, patristic quotations, etc. c. Examples of textual differences. I use Acts 4.1 and the variants related to "Priests" or "Chief Priests" or "High Priests" to illustrate the problem. d. Reasons for differences in the text. e. Principles of textual criticism. How do you teach textual criticism to your first year students? IGNTP John majuscules: How reliable are the transcripts? No I am not going to start a full-scale scaremongering on the transcripts as befell Comfort's volume on the early papyri some time ago. IGNTP John is a great project (earlier posting on this blog here), also because it has a version on the Internet. Any project that makes its database publicly accessible is of tremendous value --- but I have a few worries. Out of curiosity I checked one folio of the electronic transcript of Sinaiticus (folio 59) with my own transcript of Tischendorf's transcript, in cases of doubt with Tischendorf's transcript itself and also with the photographs. Only one folio, and only covering John 17:22 - 19:13, and this from only one manuscript. IGNTP has εκραξαν, should probably be - with Tischendorf - εκραξᾱ (with superstroke). This one is admittedly difficult as it is half under a correction. IGNTP has εισηλθεν, should be εισηλθε̄ (with superstroke). IGNTP: no ο at end of line, Tischendorf: there is an ο. On the positive side I am glad there is nothing major, on the worrying side I think 7 errors on a folio is a little high. However, the advantage of electronic databases is that it is possible to clean them up slowly over the years, and, after all, we have to start somewhere, don't we?